Back in February, or maybe even before, my friend JJ called me. 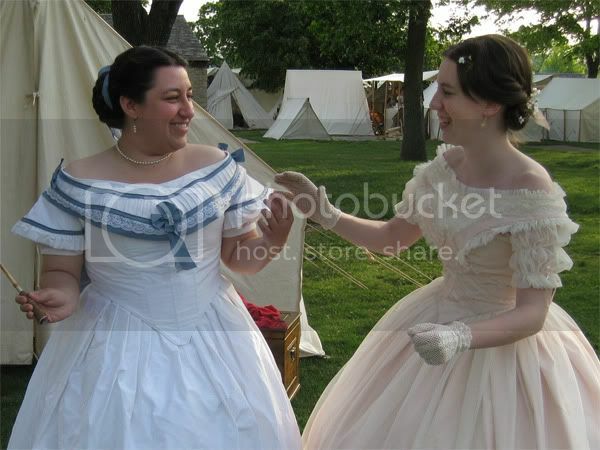 He told me on no uncertain terms that I would be going to the Greenfield Village Civil War Remembrance weekend, he would get me a participant button, and that I would be going to the ball held for the participants there. 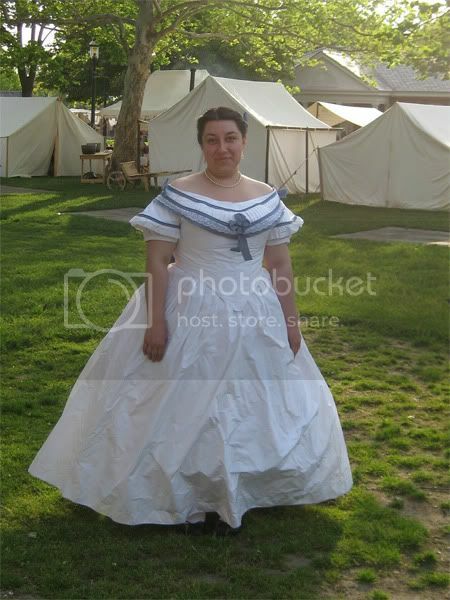 Under normal circumstances, I might have told him to get a life, but tentative plans were already forming amidst my group of friends to do just such a thing, so I dove head-first into Civil War costuming with my first project being a ballgown. This is yet another of those costumes where I was entirely dubious about it while it was in the construction phase...in fact, right up until I was wearing it at the event for which it was intended. My problem is that I'm just generally not-excited about "fancy" clothes, be it in real life or history. This dress wasn't actually "finished," by the time I was thinking about getting dressed for the ball. I had just gotten bored of it and stopped working on it after getting the bertha attached. 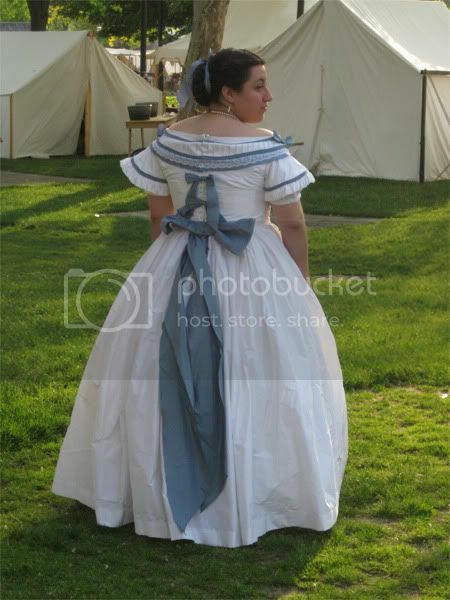 So when I showed up at the event, I had a white dress with blue sleeve trim and a bertha collar...and that's it. Because my friends are ingenious and have a more refined design sense than I do, I did not go to the ball with a plain dress. 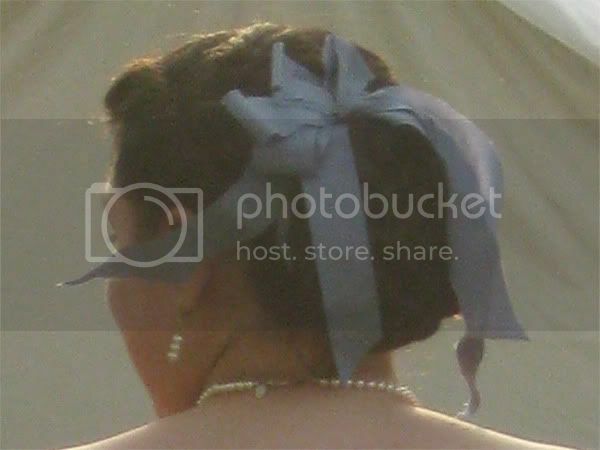 I managed to manufacture a couple of bows for my shoulders and a little cockade for the front of my collar using bias strips of my leftover blue taffeta and a suspender button that Mike had popped off his trousers earlier on the day. Two shoulder bows and a four-loop cockade. That's a suspender button I found on the floor of the tent in the middle of it; nothing if not classy! I was just finishing the cockade when Mike appeared at our camp and offered to help with bows. 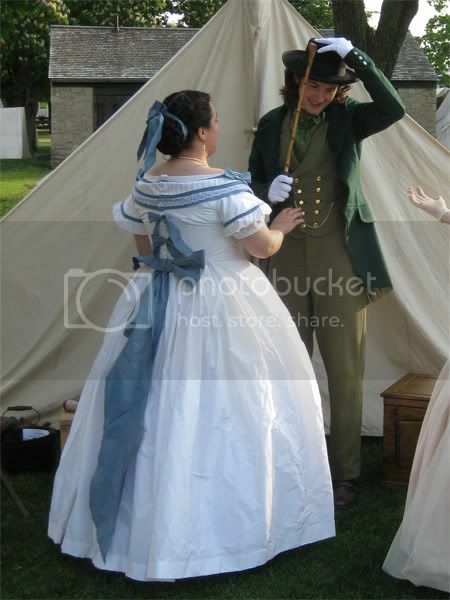 I gladly took him up on his offer and he proceeded to jury-rig the back of my dress. The back of the dress, pictured with the man responsible for the decorations you see. Everything you see there below the collar was applied by Mike McCarty just pre-ball, and is held together with dozens of straight pins. 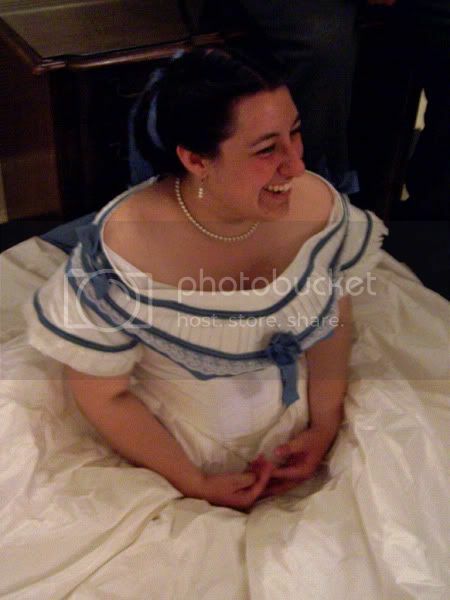 It looks fabulous, however, and I got a ton of compliments from all sorts of people--men and women--at the actual ball. More bias strips and the standby pearl set to finish off the ensemble. Pretty tired but flying high after a wonderful night!